Eight artists, two countries, and one epic music festival. 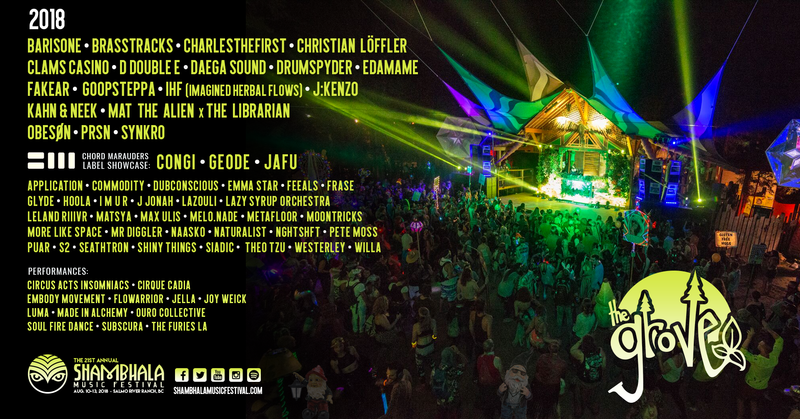 Jeff and Chandon head down to Shambhala 2018 to interview the musicians of Shambhala to talk about the festival and how the artists made their way to one of the greatest festivals on Earth. 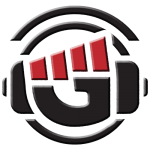 Interviews conducted by Jeff of GRadio.ca and Chandon Autumn of The Dream Zine from Shambhala, Calgary, and Los Angeles. 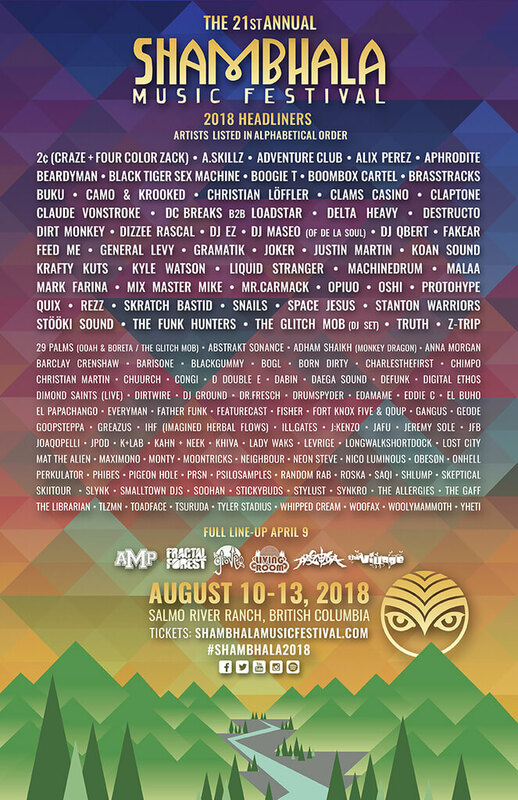 21st Annual Shambhala Music Festival – August 10-13, 2018. After celebrating a historic two decades last year, Shambhala Music Festival is excited to return to the pristine Salmo River Ranch in British Columbia, Canada on August 10-13, 2018 for the 21st annual edition. Taking place on a breathtaking family-run farm, festival goers will have the chance to experience the best of what nature has to offer throughout four blissful days, while witnessing hundreds of world-class artists across six unique stages that are individually curated and run by their own stage directors. 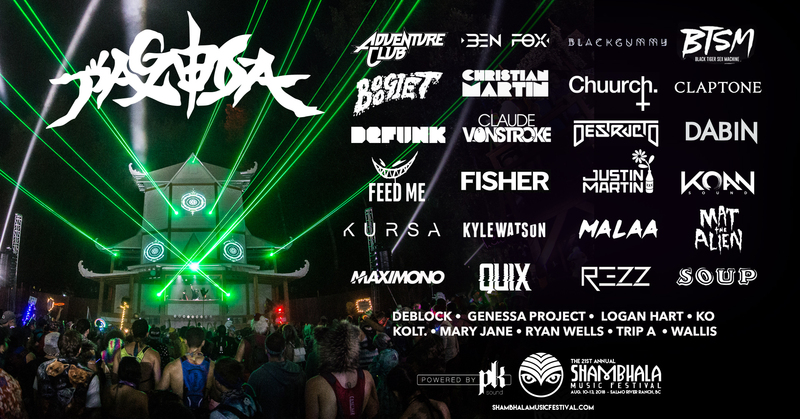 After announcing their headliner lineup, Shambhala has now revealed their full stage lineups and set times. 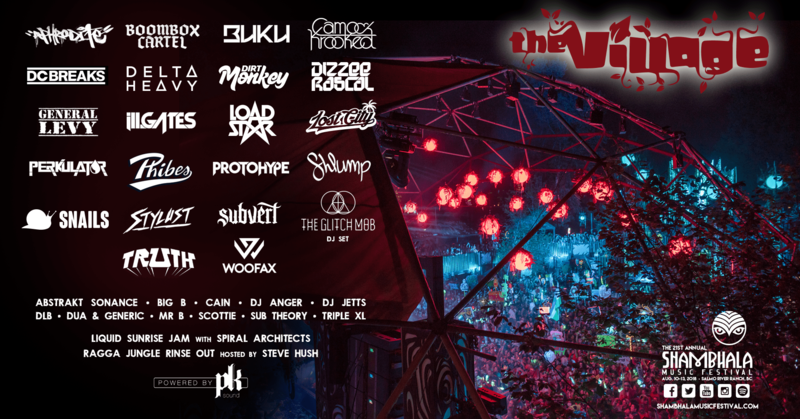 The Pagoda Stage will showcase a diverse array of electronic music ranging from the bounciest house to the grimiest dubstep. The lineup includes big name dance artists including Adventure Club, REZZ, Destructo, Justin Martin, Claude VonStroke, Malaa, Claptone, KOAN Sound and more. At The Village Stage, attendees can get down and dirty to the sounds of drum ‘n’ bass, jungle, dubstep, grime, and bass, among other genres. The lineup consists of new and returning artists such as DC Breaks, Snails, ill.Gates, Camo & Krooked, Boombox Cartel, Dirt Monkey, Shlump, the first ever set in Canada from legendary UK rapper Dizzee Rascal and a DJ set by headliners The Glitch Mob. Bringing together a veritable smorgasbord of musical flavors is The Grove, who will be celebrating their fifth year at Shambhala. Grammy award-winning brass, synth, and drum driven duo Basstracks are decorating the lineup along with bass music darlings CharlestheFirst, Goopsteppa, Edamame, and The Librarian. 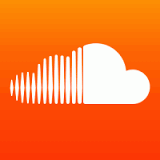 UK grime and dubstep artists will also be represented by D Double E, Kahn & Neek, J:KENZO, and the return of SYNKRO. Influential hip-hop producer Clams Casino will be adding to the vibe as Congi, Geode and Jafu team up for a three-hour takeover of soulful bass music for the Chord Marauders Label showcase, all blasted out of the inimitable Funktion-One Sound. One of Shambhala’s most beloved attractions is the emerald Salmo River. The Living Room Stage (also known as the beach stage) is the favoured daytime spot and features all of the comforting accoutrements one might find in a living room. The lineup features a mixture of electronic music, live bands, hip hop, bass and world music—with artists such as Mark Farina, Dirtwire, Dimond Saints (Live), Jeremy Sole, El Buho, 29 Palms (Boreta & Ooah), Soohan, saQi, Random Rab, Nico Luminous, Everyman, and many more—gracing the stage. 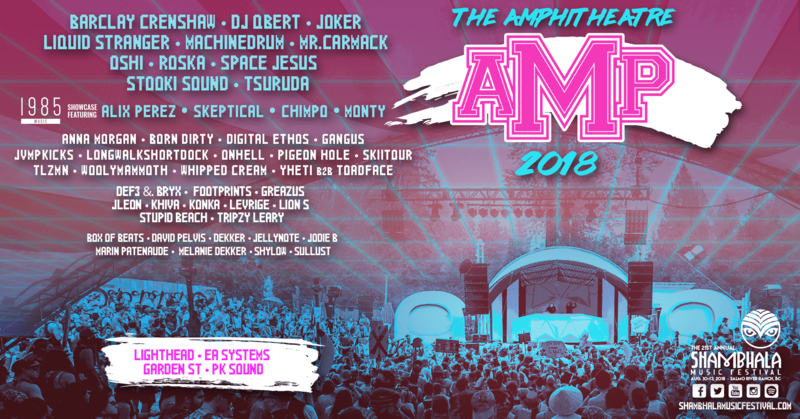 The AMPhitheatre Stage will showcase some of the most talented and experimental up-and-coming producers alongside some legendary DJs of the electronic scene. Barclay Crenshaw, Liquid Stranger, Mr. Carmack, Space Jesus, and Tsuruda are among the bass producers to perform along with UK phenoms Roska and Joker. There will also be a specially curated “1985 Music Showcase” where Alix Perez, Skeptical, Chimpo and Monty will take patrons on an aural journey through the history of drum ‘n’ bass, grime and halftime. 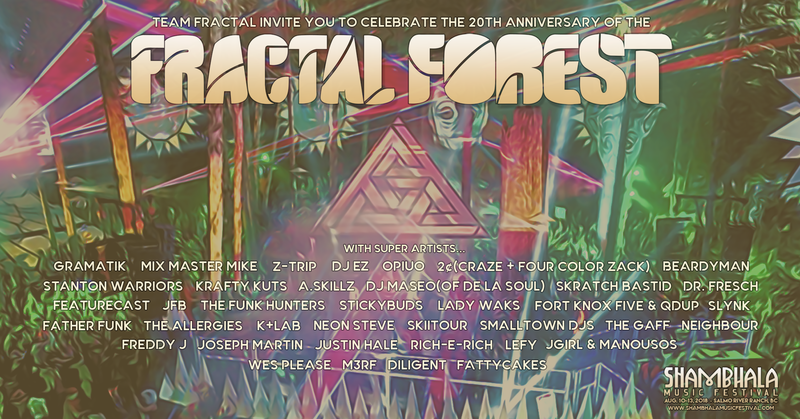 Celebrating their 20th anniversary is the fabled Fractal Forest Stage, which started in 1999 as a small stage in the forest built on an old-growth tree stump. It is now revered as a world-class music venue which will vibrate with the sounds of funk, breaks, glitch hop, dub, house, drum ‘n’ bass, turntablism, hip hop, bass and any other genre your imagination can conjure. 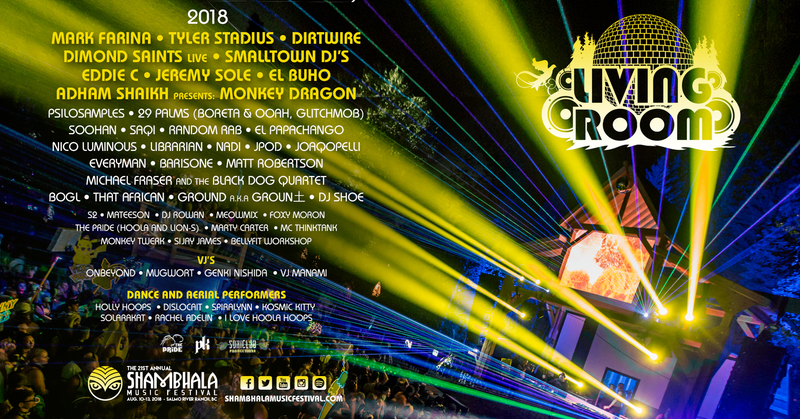 Artists on the lineup include veteran turntablists Mix Master Mike, A.Skillz and Z-Trip alongside Gramatik, Opiuo, Stanton Warriors, DJ Maseo (De La Soul), The Funk Hunters, Stickybuds, Fort Knox Five & QDup,Neon Steve, SkiiTour, Rich-e-Rich and more, along with the beloved annual Fractal Funk Jam on Sunday! As if the lineup wasn’t enough to get you excited, Shambhala is pleased to kick off this year’s mix series with Colorado-based bass artist Dirt Monkey. His exclusive Shambhala 2018 Mix can be found here and is jam-packed with enough bouncy bass music to keep you hyped for weeks. 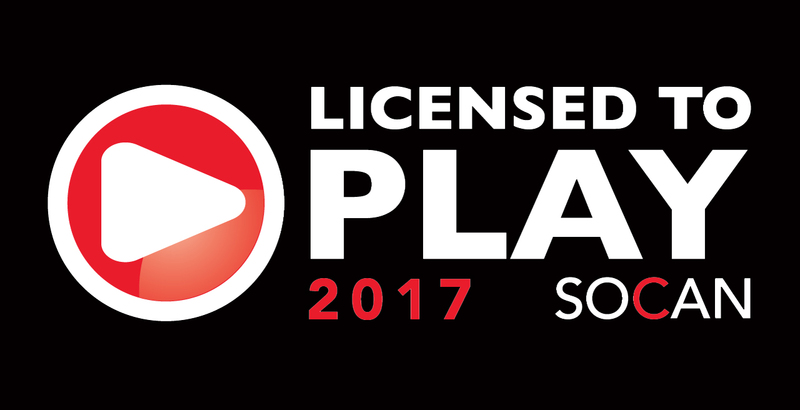 The rest of the exclusive mixes can be found here, which includes mixes from Z-Trip, Phibes, Roska and much more! A playlist for each stage can also be found on Shambhala’s Spotify. Don’t miss out, tickets are almost gone. Purchase your #Shambhala2018 tickets here. Glamping packages are offered with ShambhaLodging, in addition to some other accommodation packages for those travelling from afar who are looking for comfort and convenience. Carpool options and additional travel information is available on the Shambhala website. For more information, head over to the Shambhala website.